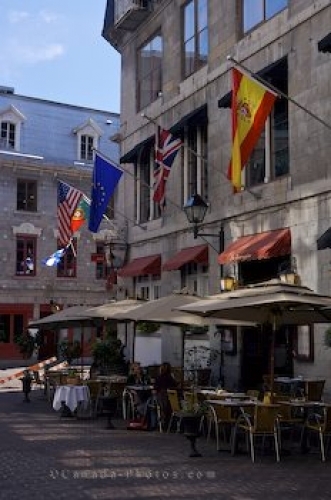 Shaded by the umbrellas, two women dine at a restaurant along the Rue Saint-Amable in Old Montreal, Quebec as the flags overhead gently blow in the breeze. The Rue Saint-Amable first originated in 1805 under the name of Viger Alley and in 1814 a group of people become land owners of some of the buildings. Over the years, more residents moved into the homes and in 1842, the residents renamed this street the Saint-Amable. Today, when visitors come to Old Montreal and stroll along the Rue Saint-Amable, one will find restaurants, a large art gallery, hotels, cafes and numerous shops all located in historic buildings. Restaurant in Rue Saint-Amable, Old Montreal, city of Montreal, Quebec, Canada. Picture of women at a restaurant along the Rue Saint-Amable in Old Montreal, Quebec.